January 24, 2018 by Ecommerce News. About Logistics with tags Germany, The United Kingdom. 6544 views. On average, 1 in every 20 online orders is not delivered on the first attempt. This costs retailers a lot of money, but it also damages the retailer’s reputation. Existing customers go away and it’s hard to acquire new ones. But what’s the main reasons online orders don’t arrive on time? Addressy surveyed 300 retailers and 2,000 online shoppers from Germany, United Kingdom and United States to find out why still 5 percent of all online orders don’t make it to the customer first time and what retailers can do to prevent this. “It seems that retailers not collecting accurate address data is the primary reason why orders do not arrive on time, but customers do not appear to realize this”, the company explains. It found out that last year, the average cost of a failed delivery was over 14 euros. 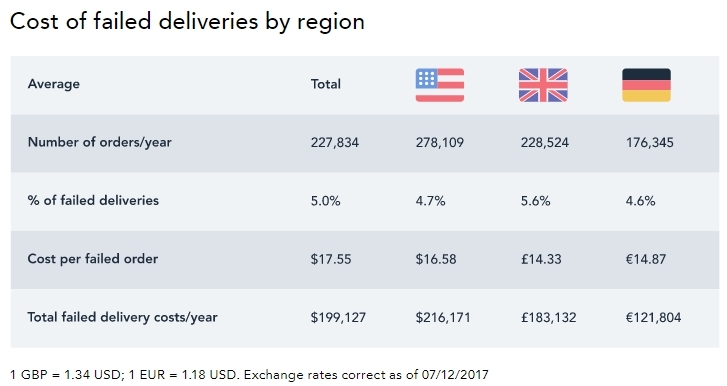 “UK businesses in particular suffer from this, with 5.6 percent of orders not arriving at their destination, and an average cost of failed delivery to the retailer of 16.4 euros.” In Germany, 4.6 percent of deliveries failed, with an average cost of 14.8 euros per failed order. It’s mostly UK shoppers who suffer from this, as 73 percent of the British consumers surveyed are affected, compared to 66 percent of US shoppers and 48 percent of consumers in Germany. Over half of consumers say they would not shop again with an online retailer that uses a cheap or bad courier. And 49 percent say they would shop online if they felt more confident about the delivery. And having the order find its way perfectly to the consumer is very important, as 75 percent of consumers say they prefer to shop with retailers that they have ordered from before. There is more going one with failed deliveries. And it all seems to be a type of miscommunication and wrong interpretations. 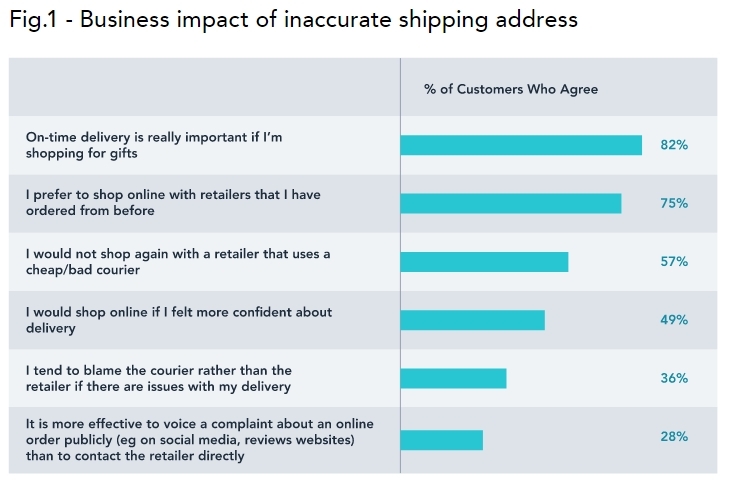 Because when Addressy asked consumers about why they thought their orders arrived late, 43 percent blamed the courier, while 34 percent think the retailer was at fault. And six out of ten retailers think customers will more likely blame it on the courier, while only 36 percent of shoppers agree with this attitude.